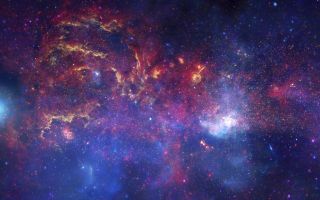 In this spectacular space wallpaper, observations using infrared light and X-ray light see through the obscuring dust and reveal the intense activity near the galactic core. Note that the center of the galaxy is located within the bright white region to the right of and just below the middle of the image. The entire image width covers about one-half a degree, about the same angular width as the full moon.